Middle School students line up as they are initiated into the Reid School chapter of the National Junior Honor Society. The Reid School desires to provide a safe place for learning – where the student is respected and learning is respected. 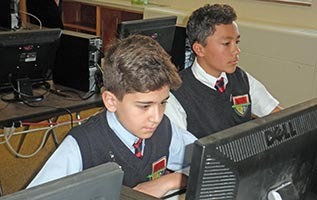 Reid School cherishes learning and is committed to establishing an atmosphere of respect between the student and the teacher. 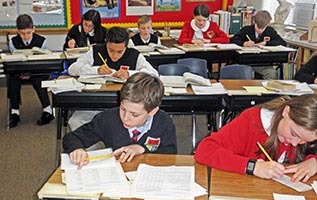 “Reid School offers consistency among teachers and in classes. There is a consistent and concerned interest in students’ success. Students who ordinarily might not achieve will when an adult invests interest in them. 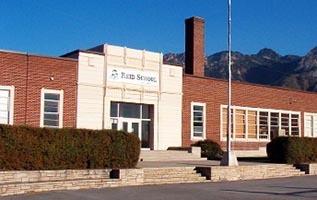 Interest in the students’ success is a primary concern at Reid School. Teachers at Reid School assume responsibility for the students’ learning. Students must be assured of this. Teachers use a diagnostic approach to assessment. They look and learn and change. Instruction for students is individualized. 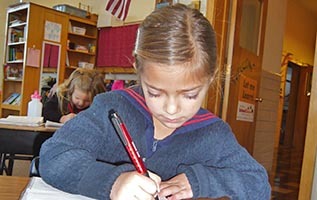 Students at Reid School soon realize that teachers and also parents assume responsibility for the students’ learning. Student success is a collaborative effort. Students consider the teacher as a professional. A Reid School student knows that the teacher has the power to teach everyone. Each student recognizes that the school will change to meet his/her needs. Students at Reid School have available to them a variety of electives, small class sizes, interest clubs, and special events. Parents are involved in the students’ activities. 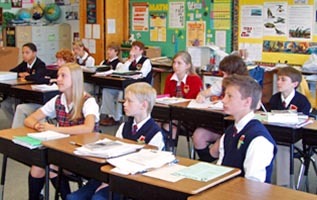 Through instructional expertise, high expectations, a safe and orderly school environment, open communications between the school and home, special services, sufficient time for teaching and learning, and frequent monitoring of student progress, students at Reid School become excited about learning and develop a secure sense of self-worth.